Ether price has dropped during the last weeks and months and people are starting to look negatively toward the future of ETH. Some of the comments that we have heard from experts are related to the fact that companies and projects are selling their ETH in order to finance the development of their products and services. Do Projects Need to Sell their ETH? But there are some projects that do not need to sell their funds in order to keep investing in the ideas or products that they wanted to develop. Martin Köppelmann, Founder of Gnosis.pm, a prediction market platform based on Ethereum, said that Gnosis can continue to finance itself without selling ETH for the next 5 to 7 years. Mr. Köppelmann explains that he cares about the usage of decentralized applications. The main number that people should be looking at is the number of users that are enjoying different dApps. At the same time, he said that it is not important how many dApps are deployed or the number of transactions the dApps process. 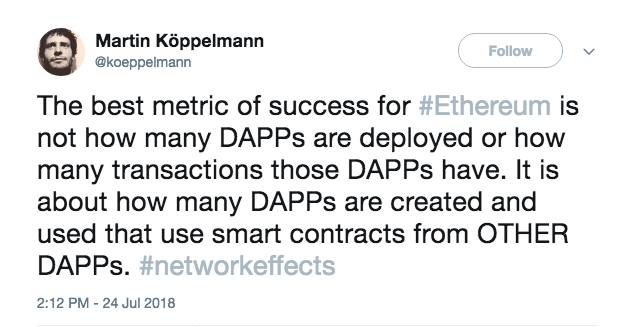 It is important to take into account how many dApps are created and use smart contracts from other dApps. Furthermore, he explained that as they have decided to work using the Ethereum platform, their main goal is to help it grow. In addition to it, they will be tweeting first on Peepeth, creating bounties on different ETH bounty sites, and using prediction markets to analyse whether they are on track or not with their milestones. At the moment of writing Ethereum is the second most valued virtual currency in the market with a market capitalization of $30 billion dollars.